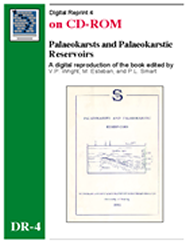 The enclosed CD-ROM contains a scanned version of the complete 1991 book, Palaeokarsts and Palaeokarstic Reservoirs, edited by V.P. Wright, M. Esteban, and P.L. Smart. The digital files are in pdf (tiff) format, which can be viewed on a computer using free Adobe Acrobat software and printed in part or in whole. This important volume brings together critical concepts for the application of karst in the study of petroleum reservoirs. The contributors are leaders in their fields, and provide a synthesis and overview of the factors affecting karst style and distribution worldwide. Recommended Citation: V.P. Wright, M. Esteban, and P.L. Smart., Eds., 1991, Palaeokarsts and Palaeokarstic Reservoirs, 158 p.